Maggie Laubser’s expressionistic paintings do not attempt to portray reality. They should always be appreciated as a personal expression of her unique view of the harmony of colours and forms in, as she called it, ‘the miracle of creation’. Her paintings have often been criticised for being naïve and childlike, but these critics miss the spiritual undertone of her work, where she strives to celebrate and praise the harmonious qualities of the Earth, and all life on it, under a benevolent Creator. She is quoted in a 1939 interview, as saying that ‘The privilege of bearing witness to these things in my simple way deeply satisfies me’. Maria Magdelena (Maggie) Laubser was born on the farm ‘Bloublommetjieskloof’ in the Malmesbury district in 1886, and attended Bloemhof Seminary in Stellenbosch until the age of 15. She later attended singing lessons in Cape Town, where she was introduced to a circle of artists and musicians. She soon switched from singing to painting classes and studied briefly under Edward Roworth. She became a member of the SA Society of Artists in 1907, and had her own studio in Cape Town until 1912. Because of her inability to earn a living through painting, she returned to the farm and decided to visit relatives in the Transvaal where she took a position as governess on a farm near Ermelo. On holiday in Durban she met JHA Balwé, an ex-Consul for the Netherlands and successful businessman, who was to become her benefactor and managed to persuade her parents to allow her to study in Europe. Maggie and her sister left for Europe in 1913. On her arrival in Holland she stayed in Laren, a picturesque rural village which attracted artists from The Hague School, America, England and France. This interaction with this broad spectrum of artists allowed her horizons to be expanded and exposed her to the stimulating modern trends in the art world. With the outbreak of the First World War Maggie moved to London and attended formal classes at the Slade School of Art from 1914 to 1919. She found the classes conservative and resented the constraint of her individualism, therefore only attending drawing classes. During this period she took painting trips to the Lake District in England as well as Scotland and the Midlands where she painted on her own. During 1919 Maggie moved to Belgium where she stayed for just more than a year. She attended drawing classes with Arnold Balwé, the son of her friend Jan Hendrik, at the Antwerp Academy where he was studying, and also became acquainted with Van Gogh’s work. She continued painting outdoors, attracted by the scenes of harvesters working in the wheat fields, which reminded her of her childhood on the family farm. In 1920 Maggie accompanied Arnold to Lake Garda in Northern Italy where they both painted prolifically for nearly a year. She always referred to this period as being wonderful, and one of the happiest times in her life, as there were no financial constraints and they could paint all day in that very beautiful, stimulating environment. Unfortunately this came to an end with the death of Jan Hendrik Balwé in 1921. Maggie returned to South Africa at the end of 1921 for about a year, after which she returned to Europe – this time to Germany where she lived in Berlin for two years from 1922 to 1924. She had contact with Irma Stern, with whom she had a painting holiday on the Baltic Sea. Apart from her general exposure to German Expressionism, she also had personal contact with Karl Schmidt-Rottluff, and met Max Pechstein and Emil Nolde. Maggie was determined to represent her personal or inner image of reality in her work and was no longer concerned with simply portraying nature. She strove to give her work an expressive symbolic character by intensifying the colour and form of the imagery. Maggie also met Prof. Jäckles, a modern portrait painter, and worked with him for some time. This led to her painting a series of portraits of men and several women which were executed in true Expressionistic style – establishing her own idiom as an artist. Maggie returned permanently to SA in 1924 and had her first solo exhibition at the Argus Gallery in Cape Town - it was a critical and financial disaster. Her unorthodox expressionistic ideas on colour and the brutal vigour of the forms were not easily accepted among the tame academic standards of the Cape. Maggie remained undeterred in her approach, and persevered with her unique expressionist style and philosophy. She spent the next few years on the farm Oortmanspost, near Klipheuwel in the Malmesbury district, painting life around her – still life studies with flowers, portraits of the farm labourers and their children, cottages with ducks and farmyard scenes. Her Swartland landscapes featured cattle, geese, pigs and figures with the occasional cottage against the backdrop of typical Boland fields and mountains. She also explored the coastal areas of the Cape, visiting and painting scenes from the fishing villages at Langebaan, Hermanus, Gansbaai, and Waenhuiskrans during 1928 to 1932. Though Maggie rarely travelled again, she took working trips to the Transvaal, the Free State and Natal from the mid-thirties, and produced portraits of Indian and African women as well as some landscapes. Although some of her strongest works were portraits, she preferred to paint from memory without the subject in view, and her subject matter continued to be drawn from the pastoral scenes of her childhood. Maggie Laubser’s career history serves as a testimony to her integrity as an artist – in her adherence to her personal vision and beliefs, she triumphed over the ridicule, hardship and hurt of years of rejection. 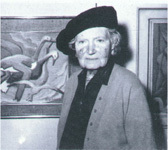 She continued to paint until her death at her home ‘Altyd Lig’ in the Strand in 1973.